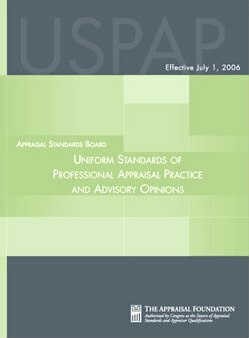 USPAP, which you might hear pronounced as "YOOS-pap," is the Uniform Standards of Professional Appraisal Practice. In short, USPAP is the "Bible" of professional appraisers, outlining how every aspect of an appraisal should proceed. USPAP is published and maintained by the Appraisal Standards Board (ASB) of the Appraisal Foundation, a non-governmental entity charged by Congress with promulgating appraisal standards. Every appraiser is charged with knowing and following USPAP, usually by operation of state law, and must complete Continuing Education periodically to relearn the basics and become familiar with new Advisory Opinions and annual changes to USPAP.